NOTE: The clipboard feature described below is currently unavailable. We are working on the problem. Our online search has been upgraded to version 2.4 of AtoM and with that has come many changes in its look and behaviour. We’d like to guide you through the major differences. One of the more exciting new features is the change in your access to copyrighted digital objects. 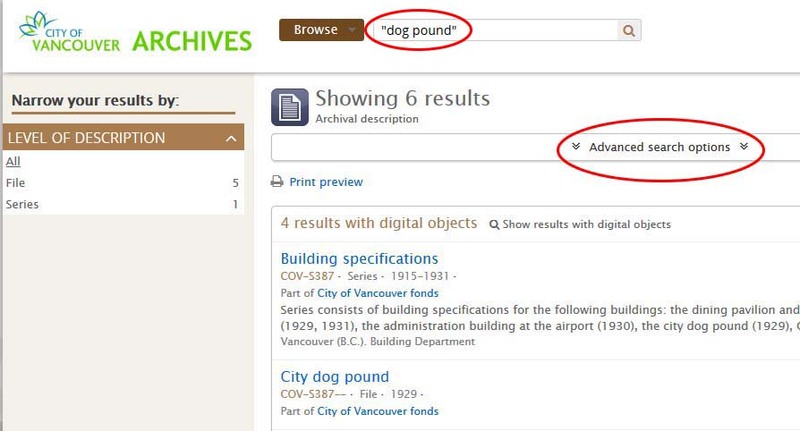 Previously, if you were searching the database from home you could only access the thumbnail of a digital object under copyright to a third party (that is, not the City of Vancouver) or of unknown copyright. 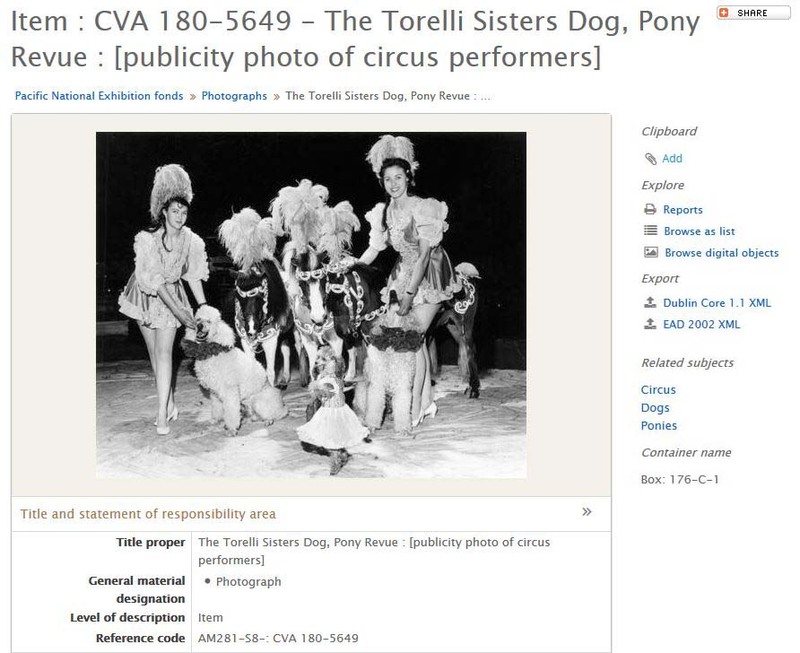 If you tried to look at a larger image, you would see a warning that said “This digital object can only be accessed in person at the Archives because of the associated rights”. You would have had to come to the Archives to see the full image online. With our upgraded system, you will now see the larger image in the full record page. Larger image of photograph with unknown copyright. Reference code AM281-S8-: CVA 180-5649. If you click on that image to save the larger image or access the high-resolution version, an agreement appears asking you to use the image for Fair Dealing purposes unless you have permission from the copyright holder. Once you click Agree, you are shown the high-resolution version. 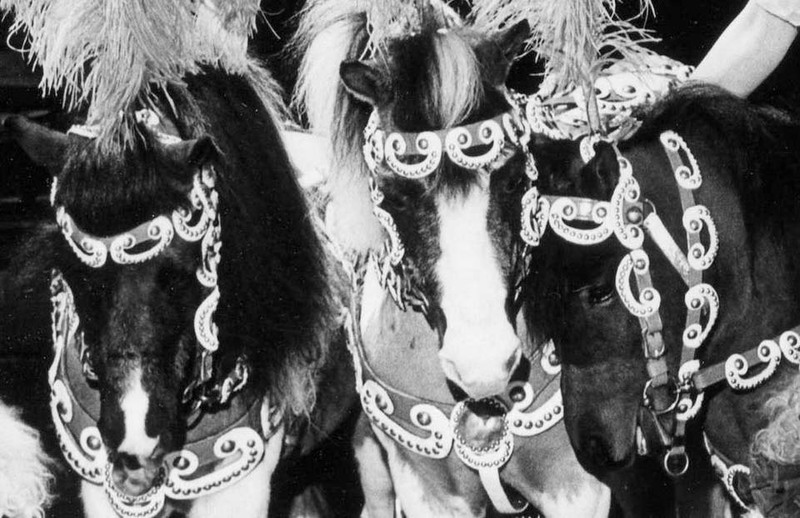 Detail from high resolution version. Reference code AM281-S8-: CVA 180-5649. This applies to any digital object that is restricted by copyright. High-resolution video and audio, which could not be viewed at home at all with the previous version of AtoM, may be downloaded and watched as long as you agree to Fair Dealing. The Advanced Search looks quite different but most of the functions are the same.To find Advanced Search, you need to click in the Simple Search box at the top of each page and a link will appear. When you click in the Simple Search box, the link to Advanced Search appears below. 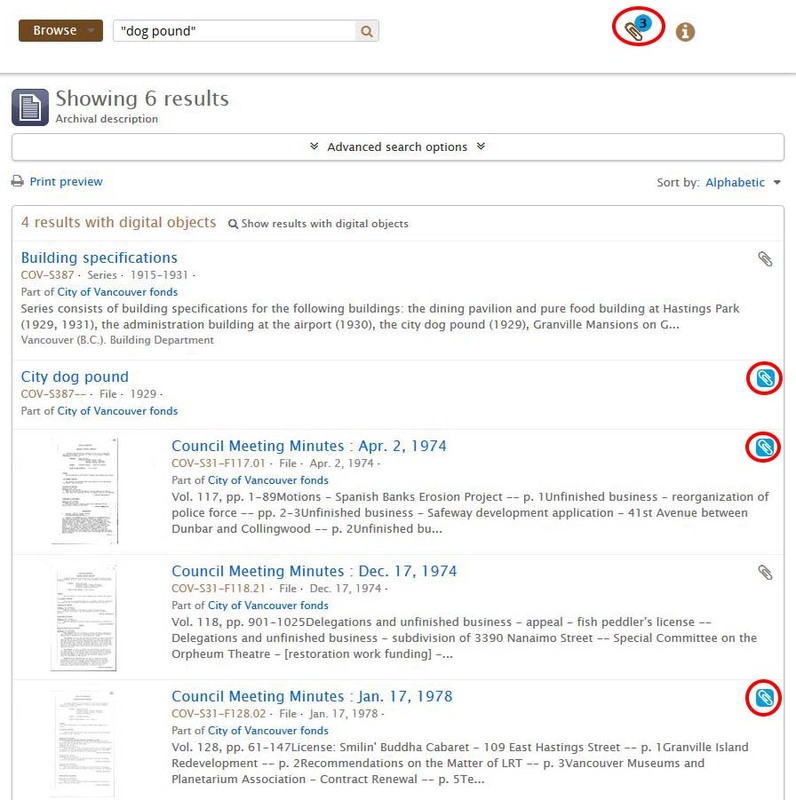 When you load the Advanced Search page, it starts with a search for every record in the database, so you will see search results before you begin to search. Advanced search before any searching has been done. The Advanced Search options have been rearranged. Options appear in the centre of the screen that used to be in the left sidebar. 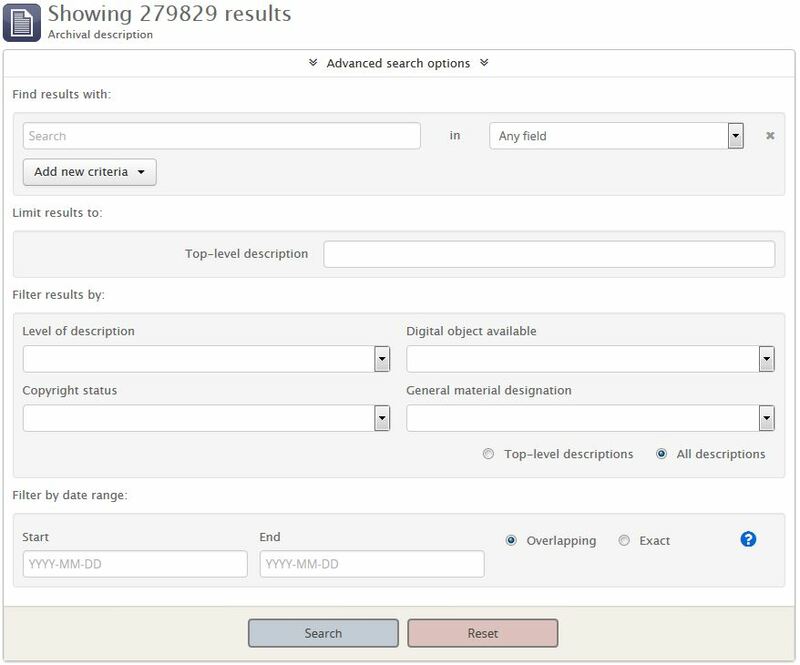 New arrangement of options in the centre panel of Advanced Search. The exception is the Media Type filter, which is still in the left sidebar but now appears as a results filter rather than as a dropdown. 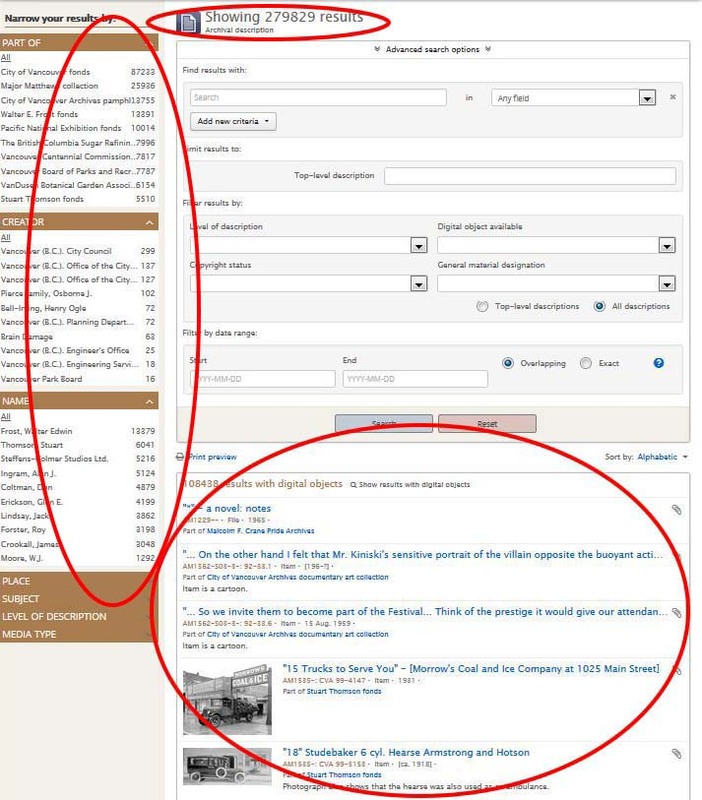 The old media type dropdown is on the left; the new version is on the right. The functional change here is the date range filter at the bottom. As well as being able to enter start and end dates, you can now specify that the date be exact. To use this feature, you must specify an exact day; an exact month will not give results. Exact date search requires year, month and day. Keep in mind that very few of our records have dates exact to the day, so this feature may miss records. Whenever you reset the Advanced Search, the date search will return to “overlapping”. 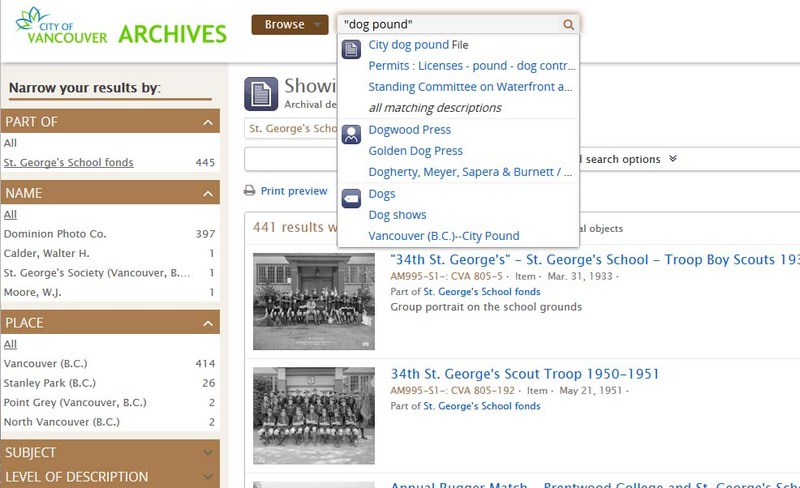 A couple of improvements have been made that make searching more convenient. When you search using quotation marks, the quotation marks stay after your search is finished, making it easy to modify that search. Searching for “dog pound” using quotation marks. Search results for “dog pound”. The original search, with quotation marks, is still in the Basic Search field. Note that Advanced Search Options appears at the top of the results from a Simple Search. Click on this and the Advanced Search will appear, along with your search terms from your Simple Search. 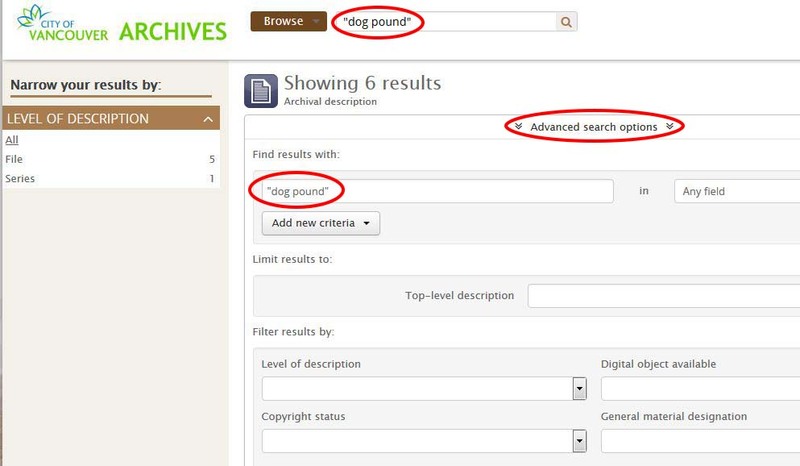 Advanced Search Options, with the search term used in Basic Search automatically entered. Two new features have been added to the list of results: sorting and list creation. This dropdown will change the sorting of your results list. To the right of every result in a list of search results is a paper clip icon. These clips add the records to your clipboard. Click on the paper clip to add the record to your personal clipboard. The paper clip changes to show that you have added that record. The paper clip at the top of the screen shows how many records you have added so far. 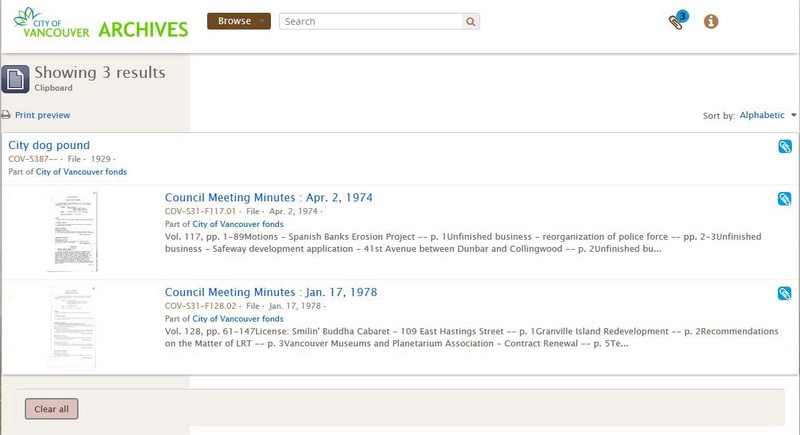 This shows the clipboard item count at the top and three records added. Click on the paper clip at the top of the screen and “go to clipboard” to see your clipboard. This shows the clipboard, with the three items in the list. The clipboard list can be printed. The titles in the list link to the full record if you want to review them and remove some records from your list. The clipboard items cannot be saved between sessions. As always, we’d love to hear your comments on these changes. This entry was posted in Digital Archives, General, Holdings and tagged searching. Bookmark the permalink. We have very few newspapers in our holdings, and I’m afraid I can’t find any union list or catalogue references to this particular paper. The paper itself might know; but it’s possible that old issues have never been filmed and deposited in a public institution.